One of my favorite home tours of the year is finally here! And, not only that, I’m sharing the first look at our new living room furniture in today’s home tour. If you’re stopping in from A Stroll Thru Life, welcome! Marty is the brains and creative genius behind the tour and always has such a lovely tour of her own! Over the next week, I’ll be sharing different ares in our home all dressed up for Christmas. Today I’ll be focusing on our living room and dining room! Our living room recently underwent a major overhaul with fresh paint, new sofas, new chairs and a new coffee table. 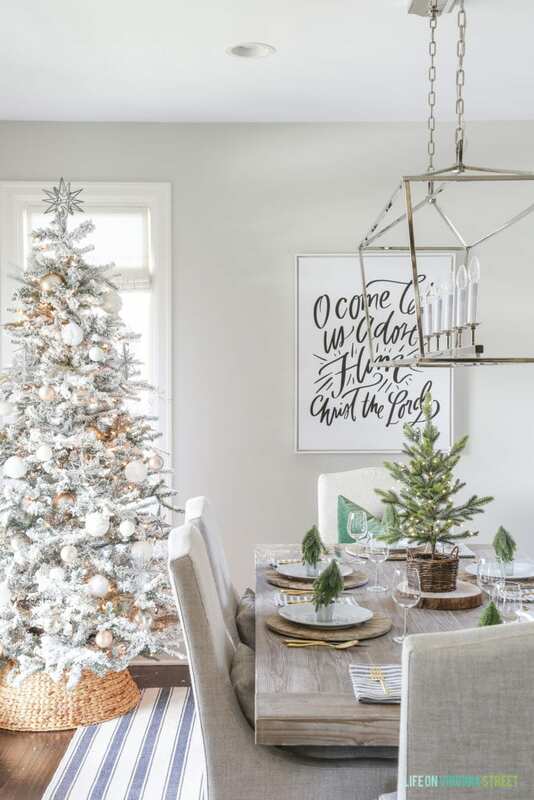 Pair that with our holiday decor and I couldn’t possibly love it more! I still have some work to do (another coat on the ceilings, painting the window trim, new shades, replacing the can lights, etc.) but I love the result so far! This year I went with a green, white and neutral color scheme. Here’s how the space looks now! Our spindle chairs are such a welcome addition after selling our dark chunky leather chairs. These just look so much more polished and give me that light, bright polished beachy look I love so much! I filled a large dough bowl (very similar one here) with greenery and some leftover ornaments. It’s very simple but also very festive at the same time! We have a slim Christmas tree in the corner of the room and I absolutely love the warm glow it provides when the lights are on! In our dining room, I went with a similar color scheme. I bought my very first flocked tree this year and I’m completely obsessed with it. After having a Christmas tree in the dining room last year, I fell in love and knew I needed to make it happen again this year! The large canvas is also from Lindsay Letters. 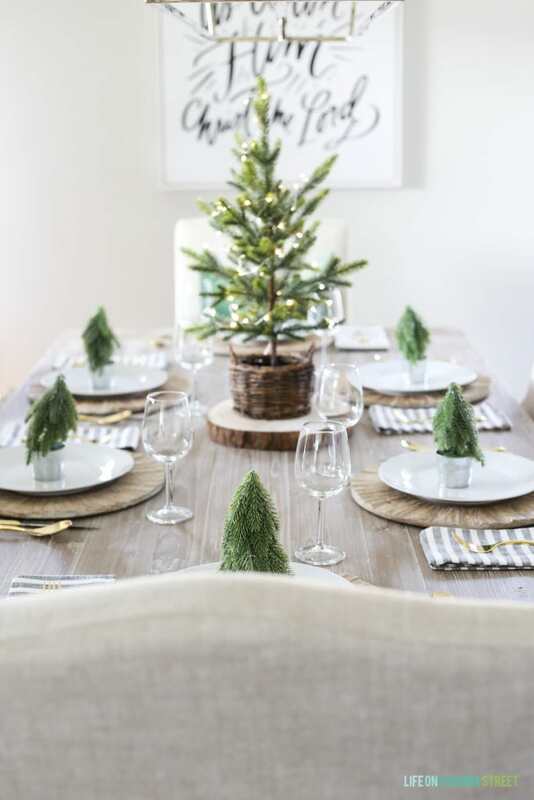 I found the mini trees in the dollar section at Target and I love them at each of the place settings on the table. 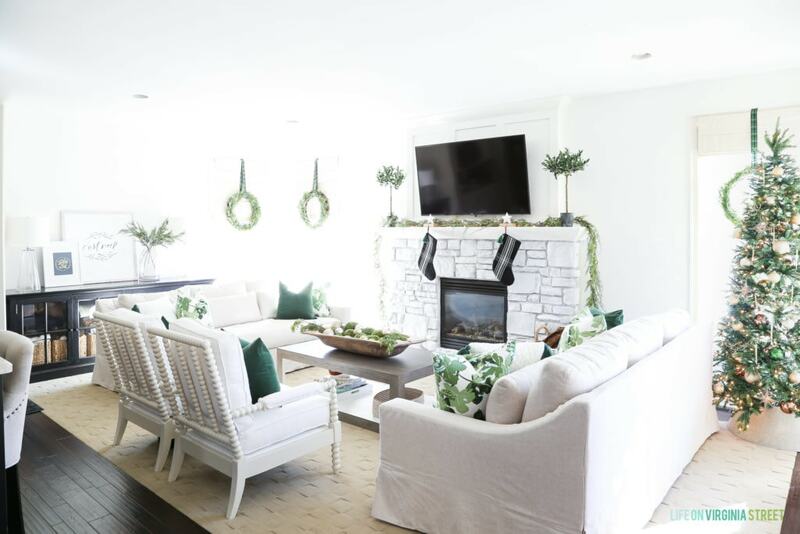 I hope you enjoyed our green and white living room and dining room all dressed up for Christmas! 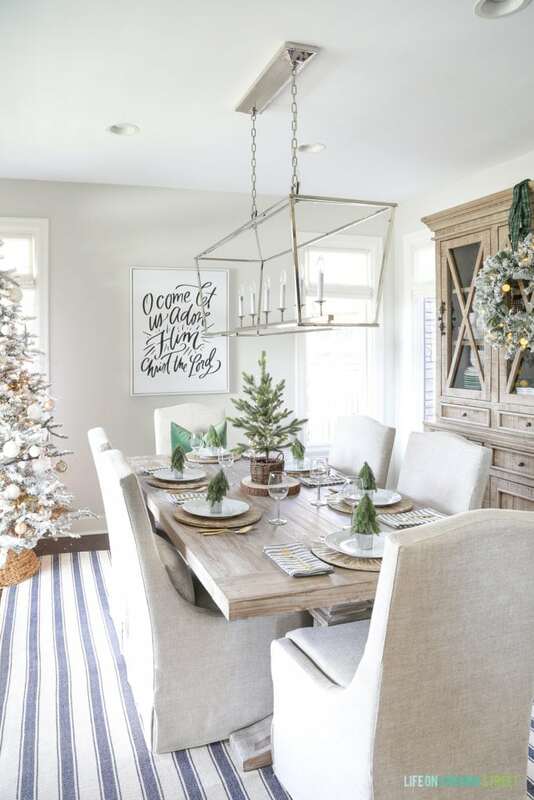 The next stop on the tour is Clean & Scentsible, and I think you’ll love Jenn’s beautiful farmhouse style home and decor! I’ve also linked to all of the other stops on the tour. So much inspiration! Stunning! I love the fresh new look and all the different shades of green. 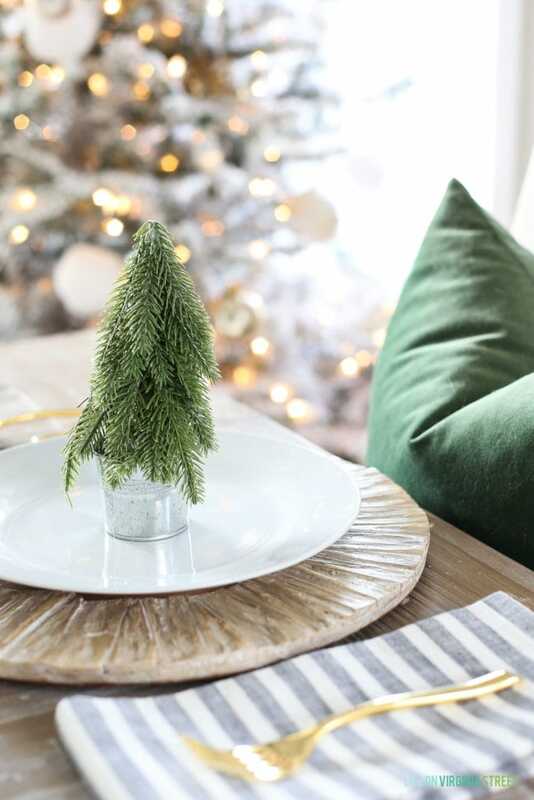 All I’ve been craving this Christmas is fresh greenery and you delivered. So good! Oh how beautiful. 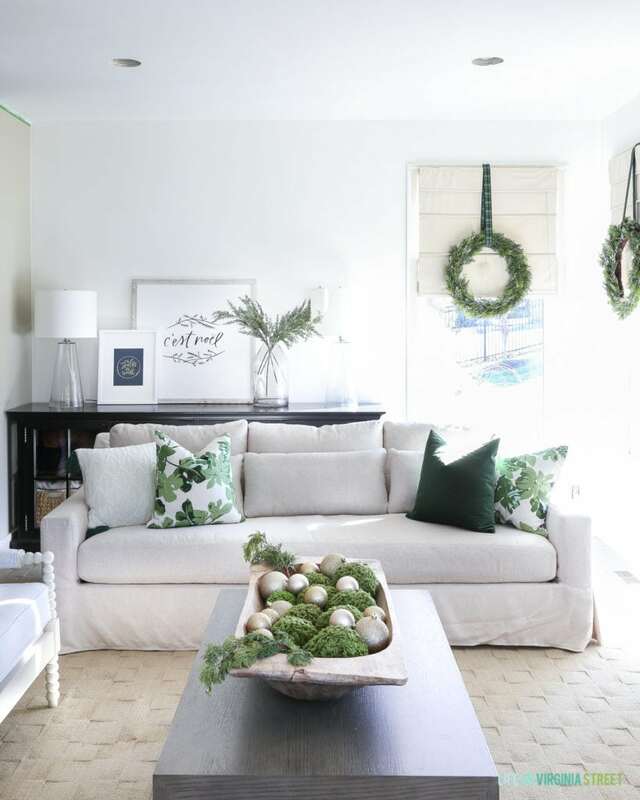 Your new living room furniture looks so petty and inviting and all dressed for Christmas it is stunning. I adore your dining room too, those little trees are perfect. Thanks so much for joining the tours, your home is GORGEOUS. Sarah your home is like a magical wintery forest wonderland. 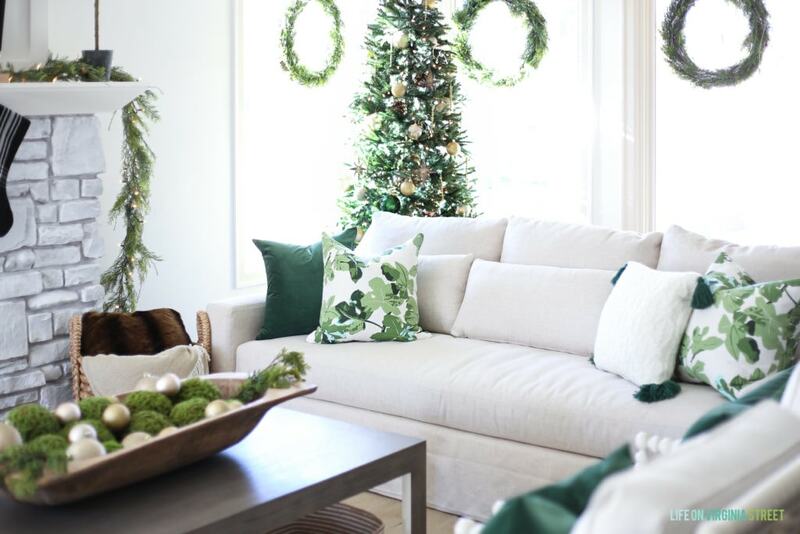 I love the white and green combination! Just gorgeous Sarah!! I love all of the green and your artwork. I’m obsessed with flocked trees too. Merry Christmas to you and your family. Sarah this is all so beautiful!! 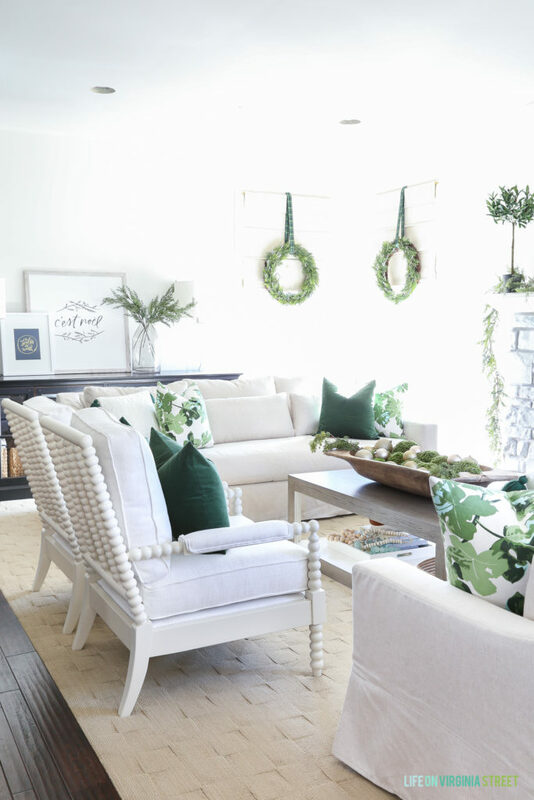 I’m in love with your new furniture – the couches and spindle chairs are gorgeous and I ADORE the green and white palette, so fresh and pretty!!! your home is always so beautiful and classic. love how your living room furniture all looks. perfection! happy holidays! Your living room was stunning before and even more so now! Love all the changes Sarah and adore all the green touches! I want that dough bowl with everything in it! As well as the trees on the plates are genius! Such inspiration as always dear! So honored to share this home tour with you! Cheers! Love the green and white. It’s so fresh and pretty!! Sarah your living room is absolutely gorgeous! So fresh and light and crisp! 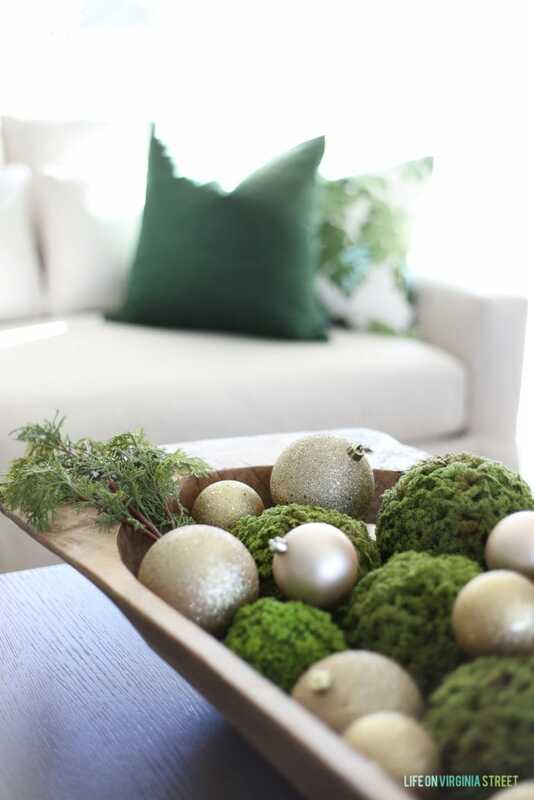 I can’t get enough of that stunning green, what a statement and so elegant for Christmas! Your whole room is beautiful and of course I love your fabulous dining room as always! Such a great job on everything! You home looks gorgeous as always, Sarah! Love the new living room furniture! Merry Christmas! Loving all the new stuff! It was worth the wait. BEAUTIFUL! Just lovely! Light and refreshing for the holidays! I love that flocked tree in the dining room! Also the tiny tree on the table, where did you get that? Your home is stunning, as always! Loving all of the green! Sarah I love the whole tour!!! The colours this year are beautiful and so fresh! Loved it all! Sarah. Just beautiful. What fabtic did you use on your couches.? Which size sofa did you go with 80″ or 95″? Where did you get the spindle chairs?? I love them! Thanks so much! They are from Wayfair. Here’s the direct link: https://rstyle.me/n/ctvpmt75re.